In emerging markets, consumers are the driving force of economic growth. The emergence of a multipolar world could not have been clearer over the last few months. After years of hyper-globalization, trade tensions since the beginning of 2018 have shown that several poles of similar economic and geostrategic strength have emerged. They are adjusting economic policy and international relations in their own interest far more assertively than in the past. Global trade skirmishes have grabbed market and media attention since early 2018 and are far from over. Negotiations over NAFTA and between the US and China are under way, and suggest that areas of agreement are actively being sought. This could eventually be very positive for markets. Nevertheless, if the negotiations are unsuccessful, threats of tariffs in specific areas could well turn into reality, creating winners and losers along the way. As the main beneficiaries of globalization, emerging markets (EMs) are often assumed to be strongly exposed to international trade. While this is true for some export-oriented countries like South Korea and Argentina, it is not for the majority of EM countries, whose exports only account for a third or less of GDP. More importantly, EMs have a powerful domestic growth driver: their own consumers. A young population and a rise in middle-class earners provide a sound basis for sustainable consumption growth. The rapidly growing penetration of smartphones opens up a broad range of online activities to EM consumers. Smartphones not only provide access to e-commerce platforms, but also serve as digital/mobile wallets. The highest activity can be observed among younger consumers, but we also see a high share of middle-aged consumers in China and India participate. 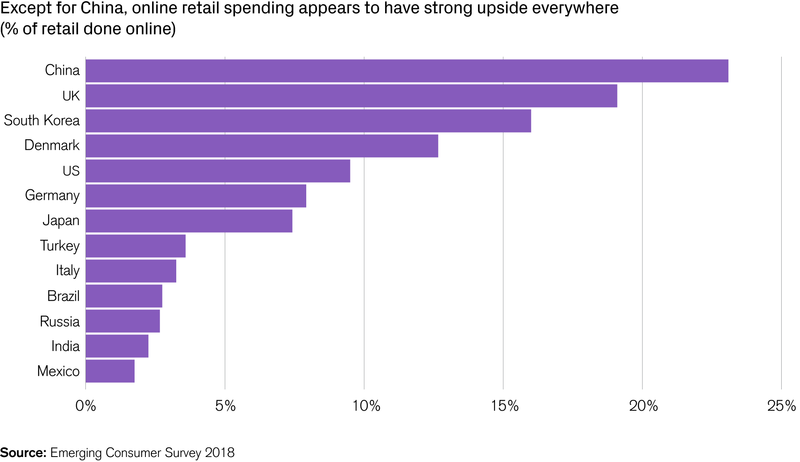 Consumer sentiment in EMs is improving in Asian countries such as China, India and Indonesia, which have the most robust end-consumer markets. Positive trends are also visible in commodity-exporting nations such as Brazil and Russia. In parallel, elements of popular frustration have also emerged in some EMs, with a possible shift toward populist governments. In this context, domestic consumer sectors and national champions may well take on strategic importance in these markets as well. The highest activity can be observed among younger consumers, but we are also seeing participation from a high share of middle-aged consumers in China and India. Emerging markets are increasingly aware that they have become an important pole themselves, with China and Russia each taking leading roles on the international stage. Given their population size, emerging markets are also the consumer markets of the future.